Η παρούσα ανάρτηση αφορά τις εντυπωσιακές αναπαραστάσεις της Κωνσταντινούπολης, της ‘Βασιλίδος πόλεων’, από τον σημαντικό Γάλλο καλλιτέχνη Antoine Helbert. Εντυπωσιάσθηκα ιδιαίτερα από τις διατομές του και τις απόψεις από αέρος. Οι ακόλουθες αναπαραστάσεις περιλαμβάνουν πέντε απόψεις της Πόλης από αέρος (οι οποίες απεικονίζουν μεταξύ πολλών άλλων κτισμάτων, τον Ιππόδρομο, την Αγία Σοφία κ.α. ), δύο διατομές της Αγίας Σοφίας (από τις οποίες η μία είναι λεπτομέρεια της άλλης), διατομές του Βουκολέοντος ήτοι του παράκτιου αυτοκρατορικού παλατίου, και του Περιστυλίου του Μεγάλου Παλατίου, τα τείχη της Πόλης το 1204 όταν οι Σταυροφόροι είχαν στρατοπεδεύσει μπροστά τους, και τέλος τη σκληρή μάχη εναντίον των Οθωμανών στην πύλη του Αγίου Ρωμανού το 1453. © Τα πνευματικά δικαιώματα των ακολούθων αναπαραστάσεων ανήκουν στον Antoine Helbert. © Credit/copyright of the following representations belongs to Antoine Helbert. 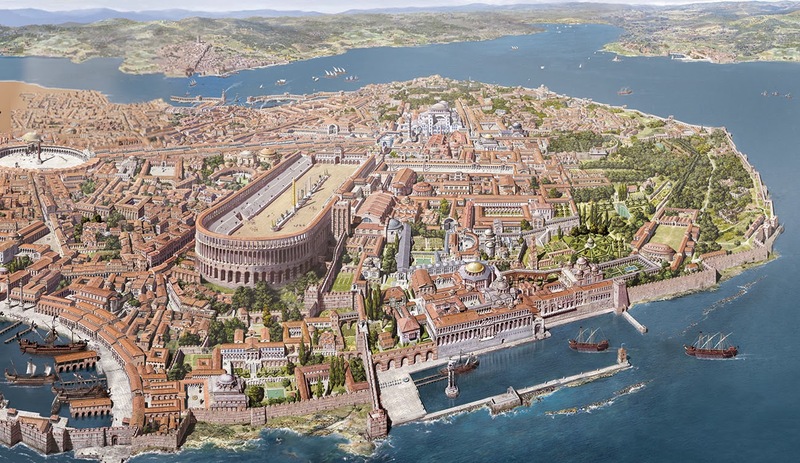 Today I’ m posting the impressive representations of Constantinople, the Byzantine ‘Queen of cities’, by Antoine Helbert, a French artist. I was impressed mostly by his cross-sections and aerial views. 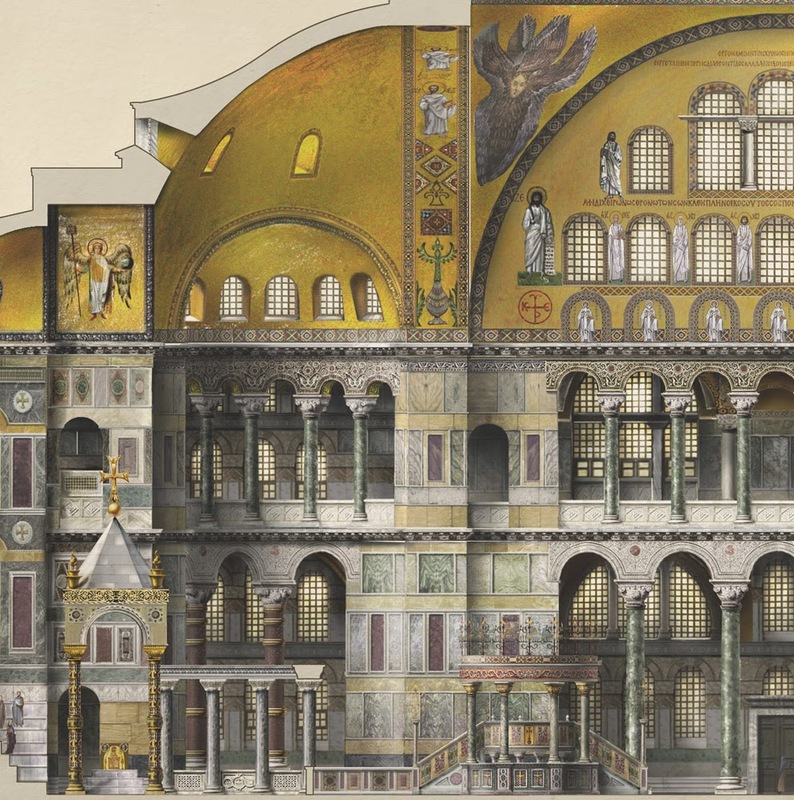 The following representations include five aerial views of Constantinople (depicting among many other features the Hippodrome, the cathedral of Aghia Sophia and many others), two cross-sections of Aghia Sophia (the one being a detail of the other), cross-sections of Boukoleon being the royal palace by the sea, and the Peristylion of the central grand palace and its hall, the walls of the city in 1204 when the Crusaders camped in front of them, and finally the battle at the gate of St. Romanos in 1453 when the city was besieged and captured by the Ottomans. After the carnage of the Roman army in the Battle of Adrianople (AD 378), the new emperor Theodosius checked as possible the Visigoths until AD 382 when he came to an agreement with them, formally accepting their settlement in the Roman territory as foederati (dependent allies). 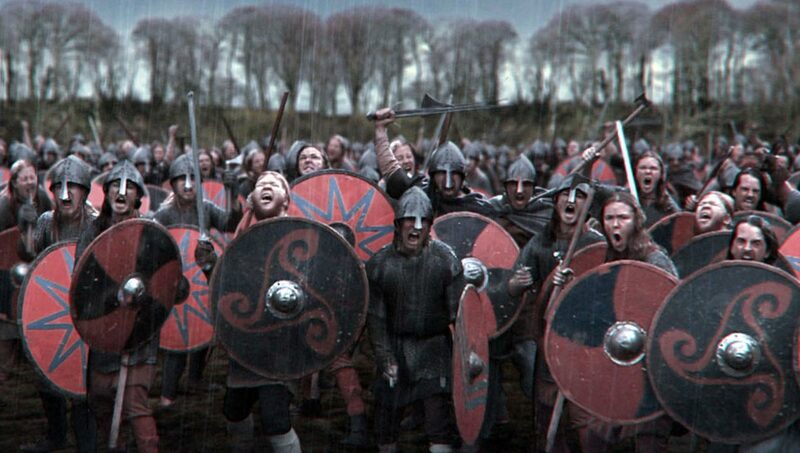 The Goths joined en masse the Eastern Roman army which was decimated after the defeat at Adrianople. They soon acquired considerable political influence in the court of Constantinople. It is characteristic that a Goth, the famous Gainas (Gaenas), came up to all the offices – one by one – of the military hierarchy and ultimately tried to seize the imperial throne, but without success. The Eastern Romans (Early Byzantines) realized the mortal danger of the Goths that was threatening the Empire and reacted violently. 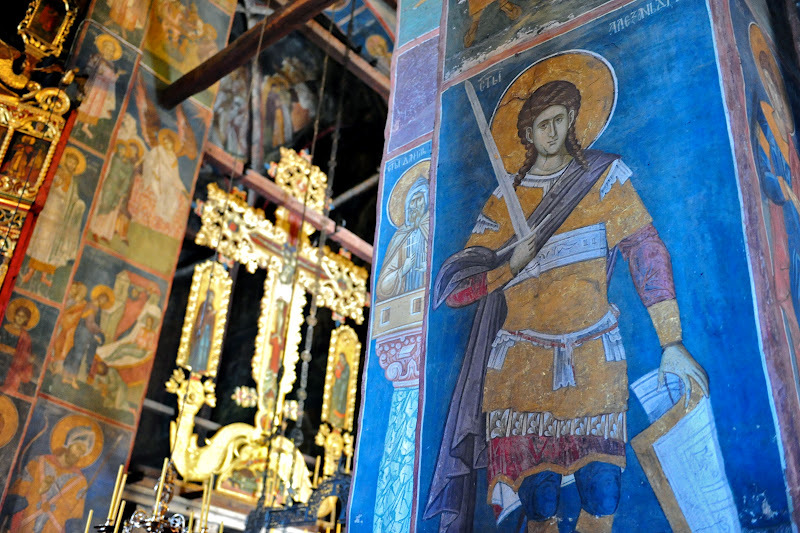 An intense anti-Germanic feeling prevailed in Constantinople and in a few years most Goths had been expelled from the administration and the military. 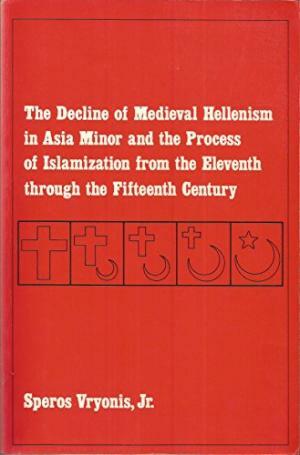 Later, the Byzantines settled many Goths in Asia Minor (in the territory of the later thema of Opsikion) who were gradually Hellenized and were called Gotthograeci (Gotho-Greeks). Until recently the modern historians used to believe that the historical Visigoths were the descendants of the Western Goths of Gutthiunta and that the Ostrogoths originated from the Eastern Goths of Hermanaric. During the last decades it was ascertained that these correlations were not correct. The Visigoth tribal union was formed around the time of the battle of Adrianople, possibly in the eve of the battle, when the Thervingi combined forces with a portion of the Greuthungi who had escaped from the Hunnish yoke and with other barbarian groups. The Ostrogoth tribal union was formed a few decades later (around AD 400) when the rest scattered Greuthungi and other Gothic-German and Sarmatian groups (namely the Goths of the Amali Dynasty and later the Goths of Theuderic-Strabo, of Radagaesus, some Alan groups and others) joined forces. However, most modern books, studies and disquisitions continue to use anachronistically the ethnic terms Visigoths and Ostrogoths for the historical events before 378.